Shaker kitchen cabinets, the Rockford door style, were used in this kitchen. To create a fun, yet classy look, the homeowners opted for the Harbor painted base cabinets. Perimiter counter top color - Please?? Very nice kitchen with plenty of storage and counter space. Nicely done. hello! I'm curious about the pendant over the island. who is that by? What color are the cabinets under the counter tops? I love them but am trying to decide if my wall color, which somewhat matches them, should be changed to a cream? Looks like it could be Madre Perla. What style and brand are the cabinet hardware? - What style and brand are the cabinet hardware? How is the cooktop vented? IS the cooktop a gas jennair downdraft? 36inch? downdraft? looking for this model cooktop also....and the vent. this is exactly the planned style for my new to-be-built island /cook top. what brand??? With reference to your built in stoves, where would the oven itself be located? Can you share the details on the countertops? How do you find the cabinet quality..thinking of buying the same ones,,,your kitchen looks great.. I already looked at the site..I was looking for some actual owner input....thanks..Every manufacturer makes their product sound like the best.. Understood. I know if you Google search "CliqStudios reviews" you'll find unbiased reviews from our customers posted on their blogs. What type of Marble or Granite was used here? Any ideas on which caesarstone, cambria, staron, etc. I could use instead of this quartzite? (I realize the quartzite is beautiful! You are very welcome! I am not aware of any man made material (quartz) that mimics this stone. It's hard to find anything with as much depth as a true quartzite. It is pretty pricey, however, it is as strong if not stronger than most granites. It's a very dense material. It holds up well to heat. You will not have a problem with stains as long as you seal it with a deep penetrating stone sealer. I would recommend Miracle 511 Porous plus sealer. I hope this helps! Let me know if you have any more questions! Countertop? - Please share the material and color of this countertop. Thank you! Please tell me the countertop material & color. Thanks! What is the countertop please! whats the color of the bottom cabinets? its gorgeous! Would you know the dimensions of the island and how far from the other cabinet it is? Thanks. Does anyone know the color of the base cabinets? light fixture info for me too, please! I went to world imports website and can't seem to find it... Would you happen to have its name so I can enter it in their search engine? Thanks! Vent - How do they vent the cook top? Or it has a downvent on the back of the cooktop. Looking at that photo, that looks like what it might be. Yes, It has a vent that raises up. That is what the back part of the cooktop is with a line. How have your Cliq cabinets held up to the test of time? hi, Please advise what material the counter tops are. Thanks. Hi Costaaqua. We supplied the cabinetry for this project and therefore only have the specifications for the cabinets. The homeowned sourced the countertops and all other materials locally. Good luck to you! what colour is the sink cabinet? What type and color are the countertops? Hi Grahamsac. We supplied the cabinets for this kitchen, but we don't have any information on the countertops or other materials used. Good luck. what is color of cabinets? What paint color is used on your trim? I’m sorry; I do not have an answer for you. Our customer-submitted photos do not indicate wall color or other details about the space. Feel free to check out paint manufacturers’ websites for interactive color swatch tools. Thats a little on the silly side! Cabinet Paint Color - Can you please tell me the paint color used on these cabinets? These are the Rockford kitchen cabinets from CliqStudios. The upper cabinets are the Painted Linen finish. The bottom cabinets are the Painted Harbor finish. Could you please tell me the color of the bottom cabints ? We have these. www.angersteins.com or call us. Light fixture information please. Love it!!! Love the kitchen! What color did you use for the cabinets and the walls? Thanks for the question! This is CliqStudios cabinets in the Rockford door style. The upper cabinets are White and the bottoms are Harbor colored. I'm not sure on the specific wall color the homeowner used here. What is the colour of the bottom cabinets? - Which paint company and paint name and number. Great question! The bottom cabinets are in the CliqStudios finish, Harbor. What is the exact countertop material and color? - Looking for the brand and color. Sorry to say that we do not have much information beyond the cabinets. 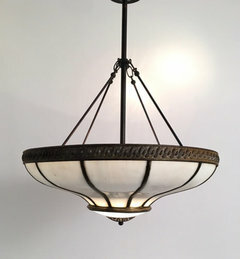 Light fixture - What brand is the island light? Nice to see Old and new integrated. Very much what is happening today in design. Size of kitchen window, including each individual panels? Thanks! Hi dajellybaby. We have the specs on the cabinetry used in this remodel, and all the other items including windows, countertops, appliances and other accessories were sourced locally, or were from the homeowner's personal collection or were existing to the home. The window placement is lovely, but we have no further information on the windows. Good luck. Countertops - As others have asked, I would also like to know material/color of countertops. Thanks. What color are the walls, ceiling and trim? Love the pendant over the island! - Do you know where it's from and approximate cost? I'm sorry, I do not. The decoration of this kitchen was handled by an interior designer. We supplied the cabinetry. Where was the pendant light over the island purchased? Thanks for your question! I'm not sure on the specific style. 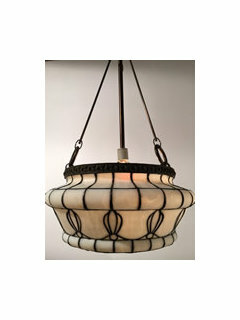 After reading other comments on this picture, I believe this pendant light is manufactured by World Imports http://www.worldimportsdesigns.com/. http://www.angersteins.com/ claims to sell it. Countertop Material - What is on the countertops? countertops - what material and color are the countertops? 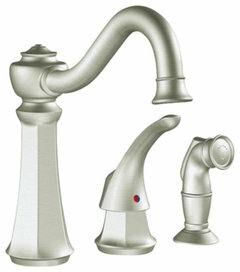 Kitchen Reno - Where can I find the faucet?? island - what are the dimensions of the island? Appliances - What is in between the oven and overhead microwave? Cabinets - What paint color was used on the bottom cabinets? How deep is the counter that the sink is on? Wall and ceiling color? - What paint colors were used on walls, ceiling, trim? Thanks! Who makes the hardware? - I would like to know the specific name of the manufacturer of the bin pulls and what style/model they are. Thanks! Countertop - What is the material of the countertop? I would have paneled the dishwasher. What kind of window is above the sink; does it open for air? What was the cost of this kitchen? labor and materials, - was this new or remodel? can you tell me the length of the counter top that runs below the window? I have a large kitchen with white cabinets to the ceiling. - I'm concerned that with the ceiling being white and the white cabinets that it's just going to be too stark. I have painted the walls sage green and this room flows into the eat-in area and sitting room. Should I paint the ceiling a different color? Choosing dark base cabinets and light upper cabinets is in vogue. CliqStudios' bottom Rockford cabinets in Harbor look sensational. 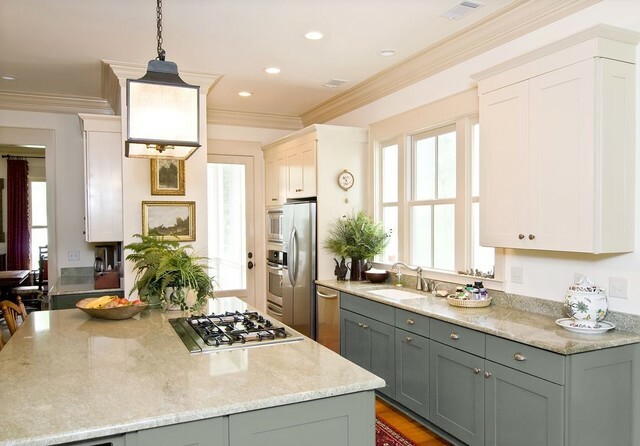 Light gray Shaker-style cabinets are a great way to modernize a traditional look. Sheila Schmitz added this to 12 Great Kitchen Styles — Which One’s for You? I love an all-white kitchen, but I know a lot of people are sick of them. Here’s a great compromise: White upper cabinets and counters, and base cabinets painted a dreamy gray-blue. The result feels classic, like an all-white kitchen, but has a lot more individuality.Note also how the lantern and paintings give the space a classic air that mitigates that “clinical” feel people sometimes complain about in an all-white space. I like the color of the cabinet if I paint the desk and other white built in a color. 12"x12" Carrara White Basketweave Mosaic, Gray Dots Honed, Chip Size: 1"x2"
12"x12" Carrara White Octagon Mosaic Tile With Gray Dots Honed, Chip Size: 2"
Decorative Hasp Black Iron 2 3/4 Incx8 1/4"